BaseballRecord: 22-18, 11-9 ACCClemson won all four of its games at home last week, including a pair of midweek wins over Western Carolina (14-2) and Gardner-Webb (7-5) before sweeping a rain-shortened series against Duke by scores of 6-2 and 8-1. 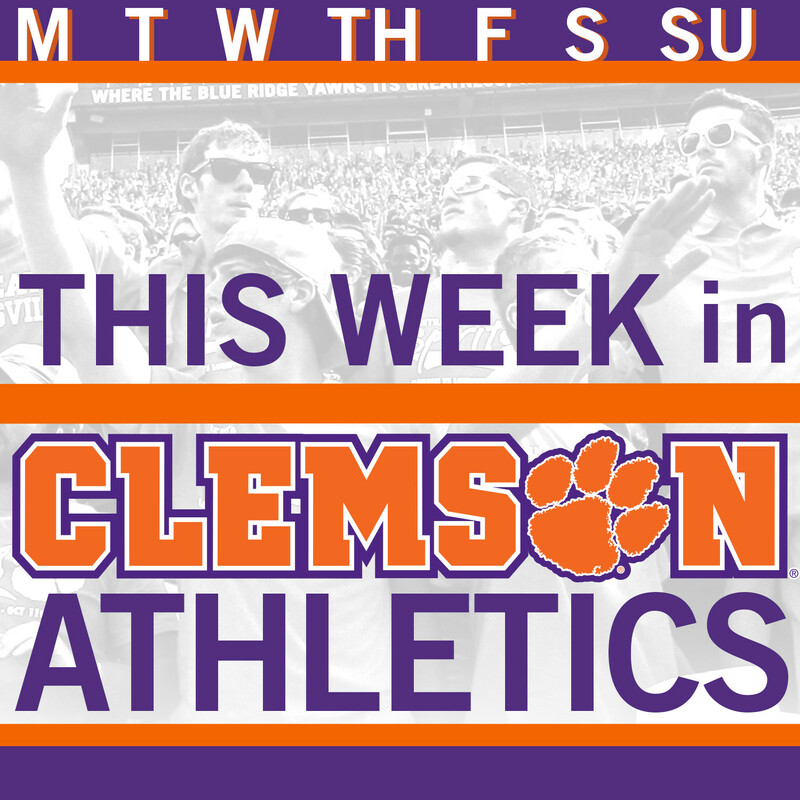 The Tigers moved into sole possession of fourth place in the overall ACC standings at 11-9. Clemson outscored the opposition 35-10 in the four games and outhit it .305 to .156. Chris Okey (8-for-15) and Reed Rohlman (6-for-12) led the charge. The Tigers also had a 2.00 ERA last week. Clemson plays four road games this week, starting with a game at Georgia on Tuesday night before playing at Georgia Tech over the weekend. Men’s Golf (@ClemsonMGolf)The Clemson men’s golf team finished second out of 13 teams at the Yale Spring Invitational in New Haven, Conn. over the weekend. Billy Kennerly led the Tigers with an even par score of 210 for his 54 holes. The only senior in the Clemson lineup finished sixth overall, his team best fifth top 10 finish of the year.Cody Proveaux and Austin Langdale finished in a tie for 16th with scores of 216, while Stephen Behr gave Clemson a fourth top 25 performer, as the junior finished tied for 21st at 217.Clemson returns to action this coming weekend at the ACC Tournament at the Old North State Club in New London, N.C.
Women’s Golf (@ClemsonWGolf)The Clemson women’s golf team closed out its 2015 campaign with an 8th-place finish at the ACC Tournament this past weekend at Sedgefield Country Club in Greensboro, N.C. The team improved by 34 shots over its score at the same course the previous year and improved from ninth place to eighth place in the standings.Freshman Marisa Messana led Clemson with a 219 score, three-over-par on the par 72 course that is the home of the PGA Tour’s Wyndham Invitational. Messana’s 219 score was the best by a Clemson women’s golfer at the ACC Tournament in the program’s two-year history and her 21st place finish was second best. It was also the highest finish in any tournament by a Clemson’s golfer this year. Rowing (@ClemsonRowing)The Clemson rowing team hosted the Clemson Invitational this weekend. 21 total schools, including 10 ranked in the most recent CRCA/USRowing Coaches Poll, competed on Lake Hartwell in one of the biggest regattas in the Southeast. Each Tiger boat raced once per session, totaling three races over the course of the Invitational.On Saturday, the best Clemson finish was by the Tiger 3V8 who finished in third of their morning race. The morning session saw the Tigers race to two fourth and three fifth place finishes in their other five heats. In the afternoon, Clemson finished fourth four times and fifth two times.On Sunday, Clemson rowed to a trio of fourth place finishes in the 1V8, 1V4 and 3V8. Clemson’s 2V8 and 4V8 crews rowed to fifth place finishes with times of 6:50.6 and 7:16.3 respectively. The Clemson 2V4 finished sixth in their race with a time of 7:43.6. Men’s Tennis (@ClemsonMTennis)Record: 11-15, 2-10 ACCThe Clemson men’s tennis team wrapped up its regular season Sunday afternoon in a close 4-3 loss to 15th-ranked North Carolina at Clemson’s Indoor Tennis Center. Seniors Alejandro Augusto and Hunter Harrington were honored prior to the match, the final home contest of their Clemson careers. The Tigers’ duo of Hampton Drake and Robert Dudley played a very close match against North Carolina’s 40th-ranked duo at No. 2 doubles before falling 8-5. In singles, Clemson’s Daffra Sanon battled back after falling in the first set to knock off North Carolina’s Jack Murray, ranked 111th in the ITA singles poll. Clemson is seeded 11th in the ACC Championships, to be played this week in Cary, N.C. The Tigers face No. 6-seeded Louisville on Thursday at 9 a.m. at the Cary Tennis Park. Women’s Tennis (@ClemsonWTennis)Record: 15-8, 10-4 ACCCurrent Ranking: 21stThe 21st-ranked Clemson women’s tennis team won its lone match of the week in dominating fashion, defeating No. 33 Notre Dame 5-0 on Friday in Clemson. The contest was senior day, and Beatrice Gumulya, Romy Koelzer, Yuilynn Miao and Jessy Rompies were honored in front of the home crowd prior to the match. The Tigers won the doubles point with wins from Rompies and Miao at No. 2 and Gumulya and Tristen Dewar at No. 3. No. 14 Joana Eidukonyte, No. 36 Koelzer, No. 59 Gumulya and Dewar all recorded straight-set singles wins to pace the Tigers. Clemson earned a No. 5 seed and a first round bye in the ACC Tournament to be played in Cary, N.C. this week. Clemson faces the winner of 12th-seeded Syracuse and 13th-seeded Louisville in the tournament’s second round on Thursday at 3 p.m.
Track & Field (@ClemsonTrackXC)The Tigers accounted for four wins and several top-three finishes over the weekend at the Georgia Tech Invitational. Tevin Hester won the men’s 200 and led the men’s 4×100 relay to victory as well. The middle distance squad stood out over the weekend, with five times among the all-time best on Clemson’s historical performance lists. Natoya Goule won the women’s 1500 with a personal best, while Grace Barnett recorded new bests in both the 800 and 1500. The Tigers return to action Thursday through Saturday at the prestigious Penn Relays in Philadelphia.